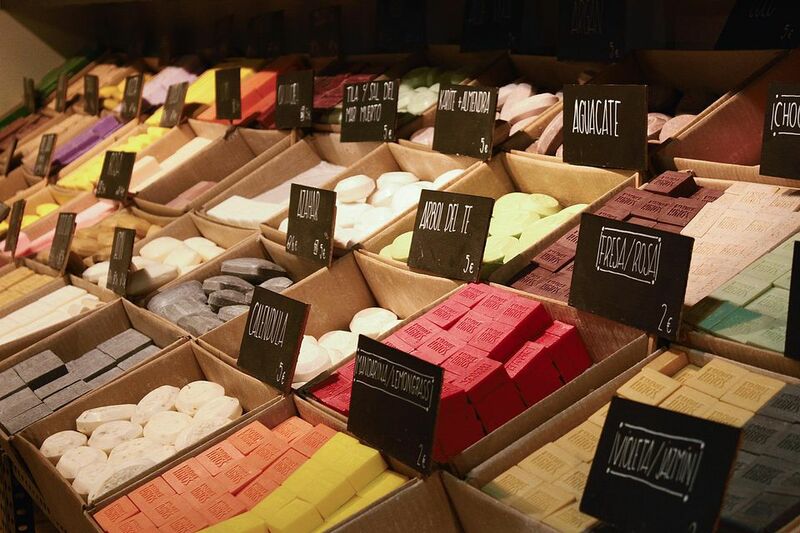 If you're making soap for sale, there are a few basic things you need to know to keep you in compliance with the industry standard required practices. For your soap to be viewed as soap in the eyes of the governmental labeling laws, your soap must be real soap, which means it is made primarily of oils and lye. And, it must not make any cosmetic claims like "moisturizing," "exfoliating," or "deodorizing," it just has to be soap. This includes melt and pour soap bases, too. Wording on the package that identifies the product as "soap"
However, most consumers want to know more about the products they are buying. They at least want to know the ingredients. So most soap makers do include the ingredients on the labels. If you're going to list the ingredients, list them per the guidelines of the FDA: list the ingredients in descending order of predominance (the percentage of the total formula) and use the most commonly accepted industry standard names. You can list fragrance as just "fragrance" and you can list any ingredients that are less than 1 percent of the total formula in any order at the end of the list of ingredients. If you plan to list ingredients, you have a choice of listing the ingredients before processing or the transformed ingredients after saponification or soapmaking. You can list those ingredients as beef tallow, water, olive oil, sodium hydroxide, and fragrance—the ingredients before the process. Or, you can list the ingredients as sodium tallowate (the "salt" made from the combination of the tallow and the lye), water, sodium olivate (the "salt" made from the combination of the olive oil and the lye), beef tallow (there's still some remaining in the soap due to superfatting), olive oil (ditto, from the superfatting), glycerin, and fragrance. See the difference? In the first one, you list the original ingredients including the lye (sodium hydroxide). In the second one, it's the ingredients as they actually are in the soap after the saponification process is done. Notice there isn't any lye or sodium hydroxide in the second one. Some soapmakers when making ingredients lists do a sort of hybrid of the two. For example, for the same castile soap recipe, you may see saponified beef tallow and olive oil, water, glycerin, and fragrance. It's theoretically correct, in that it's listing the ingredients. The main reason that people use this list is that they do not want to list sodium hydroxide as an ingredient and they do not know how to label it in the more complicated second way. Technically, you do not have to list the ingredients. You just have to label it "soap," say how much it weighs, and where to find your company. But, in order to make sales and drive a good business, you have to give people what they want to know. And, they want to know what is in these types of products. It is likely the main reason your potential customers are buying handcrafted soap to begin with. So for that reason, it is best to list the ingredients in the clearest and most easily understood method possible, which is usually the first option by listing the ingredients as they are before the saponification process.